We should have 123 in stock. Need more? It usually takes us 1 - 3 weeks to bring more in. 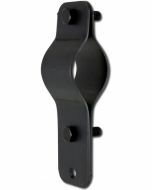 Formed of 10 gauge steel for snug attachment to 1-1/2" Sch. 40 pipe battens. 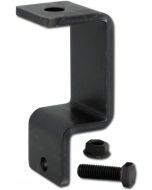 Two-piece assembly is attached using 3/8" Grade 5 bolts. 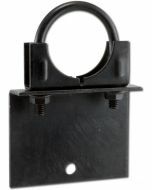 Top hole is sized for installation of a turnbuckle or shackle. Thimble is possible to fit, but extremely difficult to thread through. Black Finish. Working load limit of 1400 pounds based upon straight pull. 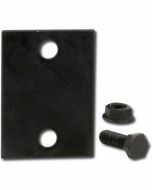 1.42" x 2.1" x 6.75"